The Flashback X4 Delay & Looper combines four Flashback delays plus a 40-second looper with 'undo' function into one amazing pedal that takes delay to a place it has never been. 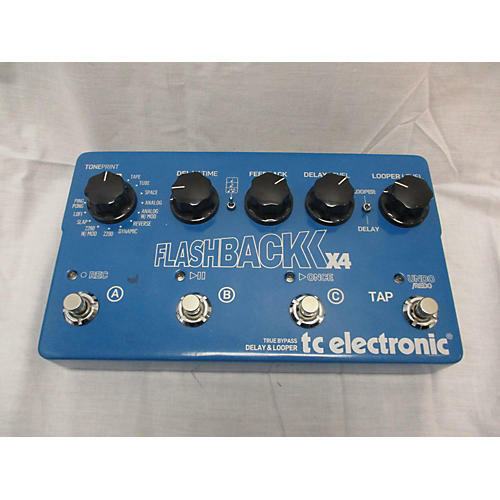 TC Electronic made sure the Flashback X4 delivers the legendary TC quality at every turn. From the awesome digital 2290 sounds to beautiful analog tape echoes and more exotic vibes of a reverse delay, it contains virtually every delay sound under the sun - past, present and future. It's even equipped with four TonePrint slots that can be loaded via smartphone or USB port..